To do math. Also, cipher can refer to someone who has no weight, worth, or influence--a zero. Another meaning is a message in code, or the process of creating a coded message. Cypher is the typical British spelling. and then turned in. This afternoon I have had a farmer's job--sprouting potatoes." Slops refers to ready-made clothing carried on board ship and issued to seamen, with the cost deducted from their wages. today." To take in the sails of a vessel and secure them with gaskets. In the case of square-rigged ships, to haul in on the clew-lines and buntlines and roll sails up to the yards. In the case of fore-and-aft rigs, to lower and secure sails to the boom or stays.."
Unbend To untie or loosen a sail or rope. the sails." The nautical term for rowing is pulling; thus a pulling boat is a rowed boat. the boat from one place to another until noon. After dinner I worked in the cabin until three o'clock, then went ashore. It is just a year ago today since I came aboard the ship." Nov. 7: "Went with the mate to get a net....did not get any fish....Wend aboard the ship S.F. Hersey with the mate." A boat race, or series of races. today; the Capts. and wives were on board us to witness it. They had a supper aboard of the Fernando and a party in the evening. The American boats beat. I went for the Capt. after supper and waited until eleven o'clock." Droppings of sea birds, with high levels of phosphate and nitrogen making it valuable for fertilzier. Starting in the 1840s centuries of deposits were mined at the Chincha Islands off Peru. Supplies were effectively exhausted in the 1870s; many Maine ships and captains worked the guano trade. in this afternoon; I have been at work putting it up in bags. It is disagreeable work." Nov. 11: "Took the Capt. aboard the David Brown and back. After dinner I done a little washing. At half-past two went after the Capt. and aboard of several other ships until we had a crowd of five boats with their Capts. and wives, then we set them all ashore; in the beach the surf ran a little and we had a great time getting the men ashore. When they came back the surf ran so high that we had to launch our boats and go to the mile for them." Nov. 15: "This afternoon I have been at work in the hold. I take my wheelbarrow the same as a man." 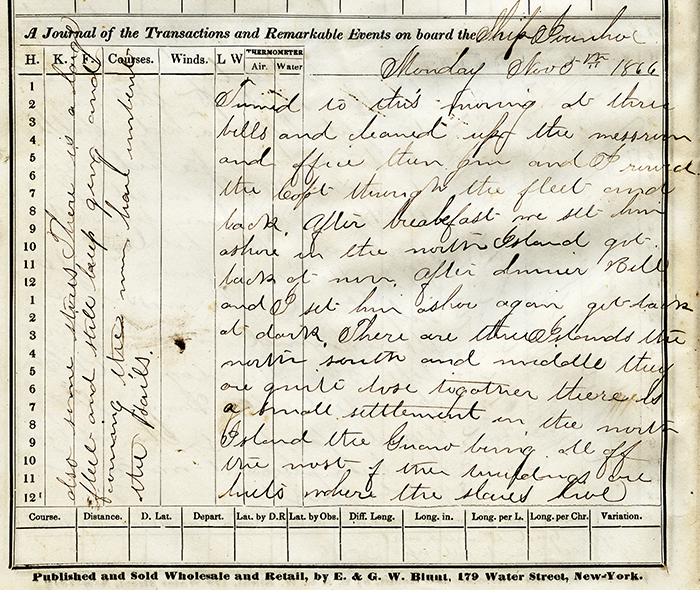 Nov. 17: "This afternoon I worked in the hold part of the time, then cleaned a barrell (sic) of hams and salted them." Nov. 18: "The mate went a fishing this morning and caught quite a number; after breakfast I had to clean them. Then I went aboard of the Juliette Trundy and went in her boat aboard the Old Colony."